From Botticelli’s thoughts on his conflicts with church ideology to Holbein’s impressions of the court of Henry VIII and Dalí’s definition of surrealism, this fascinating compilation features the opinions of the most celebrated painters of the Western world, from the 13th century to the present. The artists speak about their aims, methods, and ideas regarding art and other artists, ranging from Giotto’s reminiscences of his apprenticeship, to Roy Lichtenstein’s evaluation of pop art. Here are the thoughts and insights of van Eyck, Vasari, El Greco, Rubens, Hals, Rembrandt, Vermeer, Watteau, Hogarth, Goya, Corot, Manet, Degas, Cézanne, van Gogh, Matisse, Wyeth, Pollock, Johns, and a host of others. 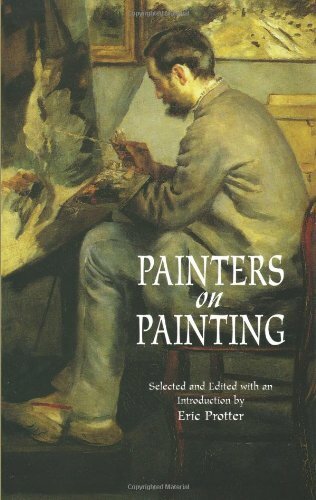 Selections, many translated here for the first time, include advice on technique from such masters as da Vinci, Dürer, and Renoir, and engrossing personal reflections for creating “Guernica,” and an explanation by Chagall of his symbolism. Enhanced with over 60 illustrators, this book will be an ever-present source of practical and theoretical advice for working artists. For any art lover, it is a browsing book of exceptional interest, offering the unique perspective of artists through the ages.